It has been awhile since I've posted - what can I say? Life got in the way. A new baby, a new job, and a new home in a new state tend to disrupt hobbies. I'm now in the Bay Area, and excited to explore the local flora and fauna. I'm lucky enough to work very near a birding hotspot - Shoreline Park at Mountain View. And that of course places me close to Palo Alto Baylands and not too far from the Alviso birding hot spot. I've already made three or four trips over to Shoreline, and have some good material and photos to post. I'll post more about the area in the near future, but I'm excited to post some photos. One of my walks to Shoreline took me across the park to Charleston Slough, which borders Palo Alto and Mountain View. Charleston Slough is affected by tides, making it an excellent shorebird spot or duck/grebe spot depending on the tides. 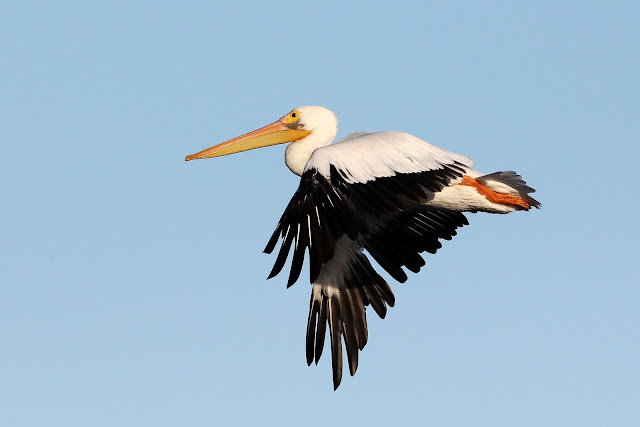 This time of year, American White Pelicans congregate in great numbers, drawing the attention of birders and non-birders alike. 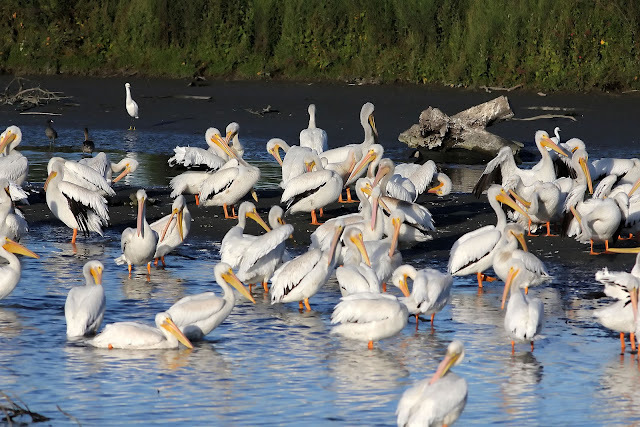 I've seen American White Pelicans in Nebraska, Arizona, and even in Yellowstone, but never anywhere close to the numbers that occur at Charleston Slough. I'd conservatively estimate a count of 200 the evening I stopped by in mid/late September. Pelicans are one of the easier birds to get nice flight photos of. Their white/black contrast make it easy for auto focus, as does their size.